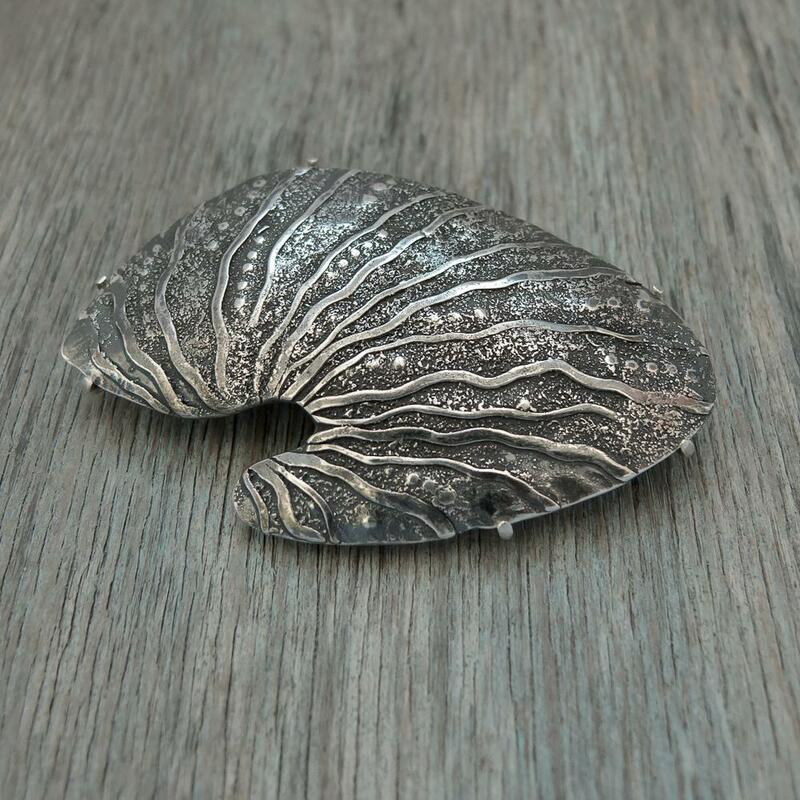 The Hunt, a jewellery brooch commission, a guest blog by Evie Milo. Guest Blog by Evie Milo - The Devil's Toenail, a special jewellery commission. I did just that recently when I took on an interesting brooch commission. All I was given initially was this very simple sketch, that to me looked like a half eaten croissant. I didn’t know what it was and awaited further information. 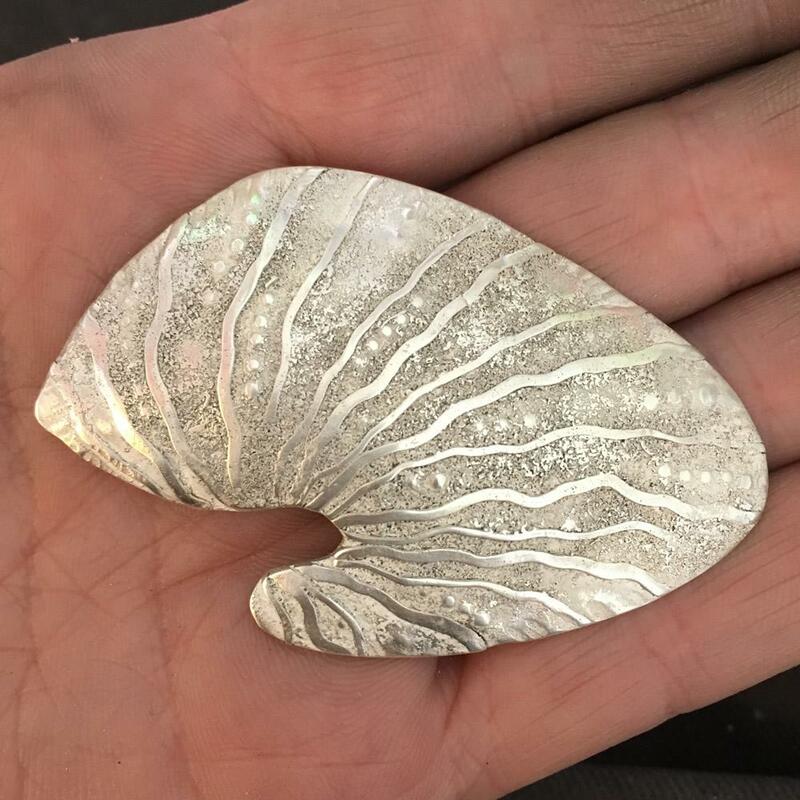 I soon found out that the image depicted a Devil’s Toenail Fossil, which is something I’m quite familar with and my task was to create a solid silver brooch using this as inspiration. How did this commission come about? Well as you may know I’m part of a small online jewellery collective set up and run by Emma White of Pink Butterflly (currently getting rebranded as The Jewellery Makers). I met Emma at BCTF a few years ago and she’s an amazing person to work for and with. When the commission landed on her desk from Rebeka Haigh from Frolicked, she thought it was right up my street – she wasn’t wrong. Rebeka Haigh – Beka – is an extremely talented and slightly bonkers (but in a good way!) puppeteer. She owns a puppet/events company called Frolicked. She created an event called ‘The Hunt’ which was a treasure hunt across Yorkshire as part of the TourdeFrance cultural celebrations in Yorkshire, back in the summer of 2014. 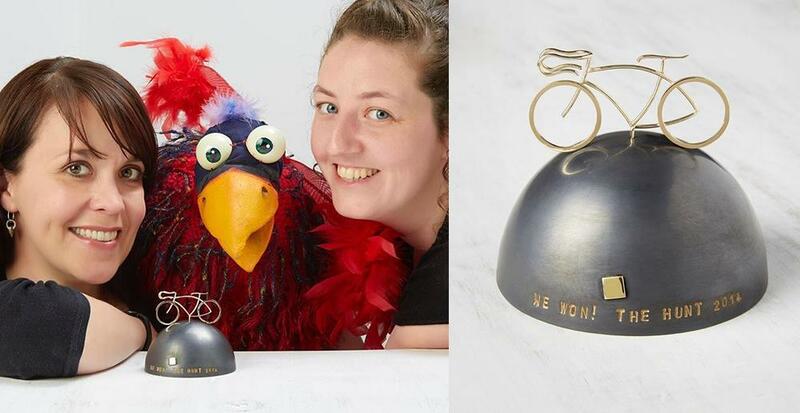 That year Emma was asked to design and make a solid gold bicycle as a trophy for the winner. This year Beka has created another amazing treasure hunt, that started a few days ago and continues throughout July. I now have the honour of making the prize this time. Exciting stuff! Initial stages of any commission finds me with a totally blank head and a bit of panic if I’m honest – with a completely blank slate it’s hard to formulate ideas at all. All I had was a simple sketch, the idea of half eaten croissant, that kept making me feel hungry and a weekend of time to formulate a plan. So I dug out some fossil books, went for lots of walks on the beach for inspiration, searched the web for images and even dreamt about it. I’m not one for sketching out ideas on paper, I prefer to play with ideas in my head and with a job like this I’m very hands on and like to try things out and experiment to see what happens. My sketchbook is mostly used to write down calculations and and costings and what type of wire I’ve used for this or that and thickness of metals and tools used. I had a few set things in my head that influenced my approach to the project. 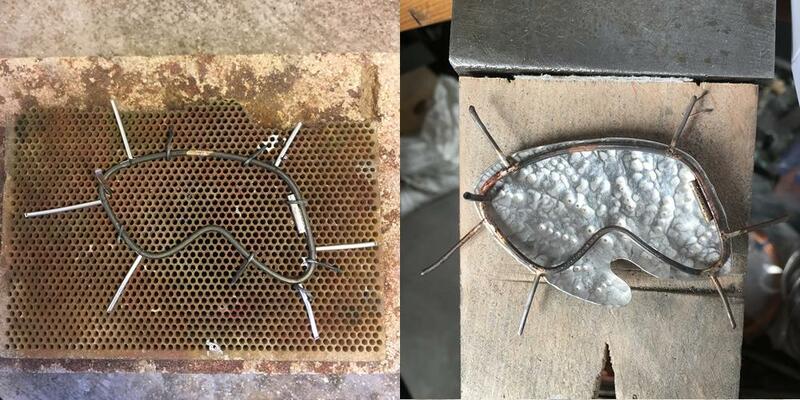 I knew I wanted the brooch to be curved/domed and held in place by an armature – as if it was a precious fossil found, mounted and displayed – so this influenced how I was to make the brooch back and pin. 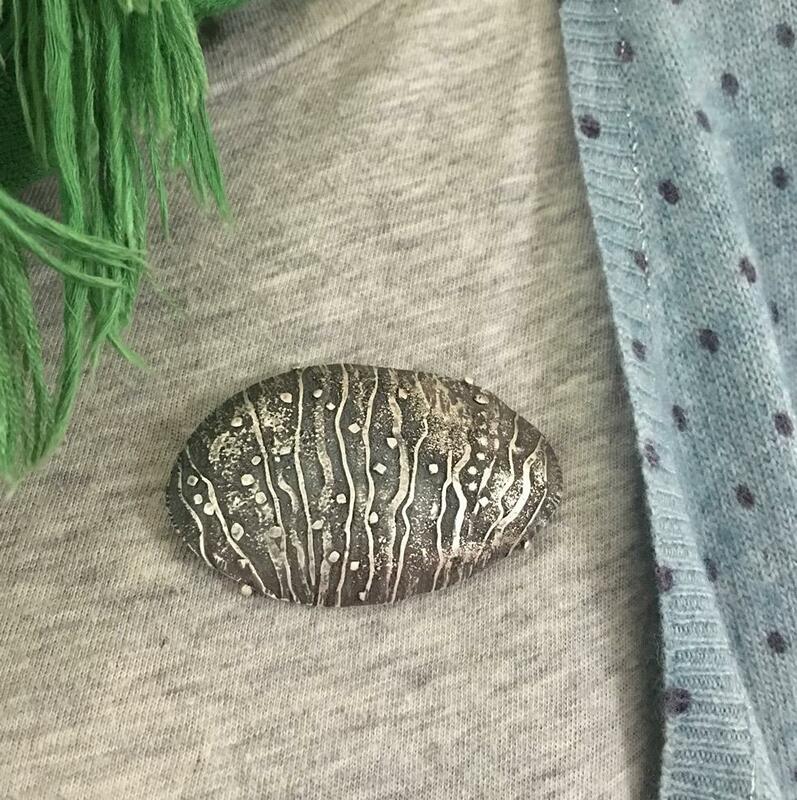 I also had a clear vision in my head that the back of the brooch needed to be interesting to look at as well as I hoped to make quite a tactile piece that could be held and admired as well as worn, so it had to be nice to touch from either side. With these plans in mind I set to work. As you know, I only work with recycled silver, so with a few small pieces of flattened spoon bowls, pieces of EcoSilver wire and some silver dust, I tried out lots of texturing ideas that I use within my normal practice and tried to apply them to this commission. 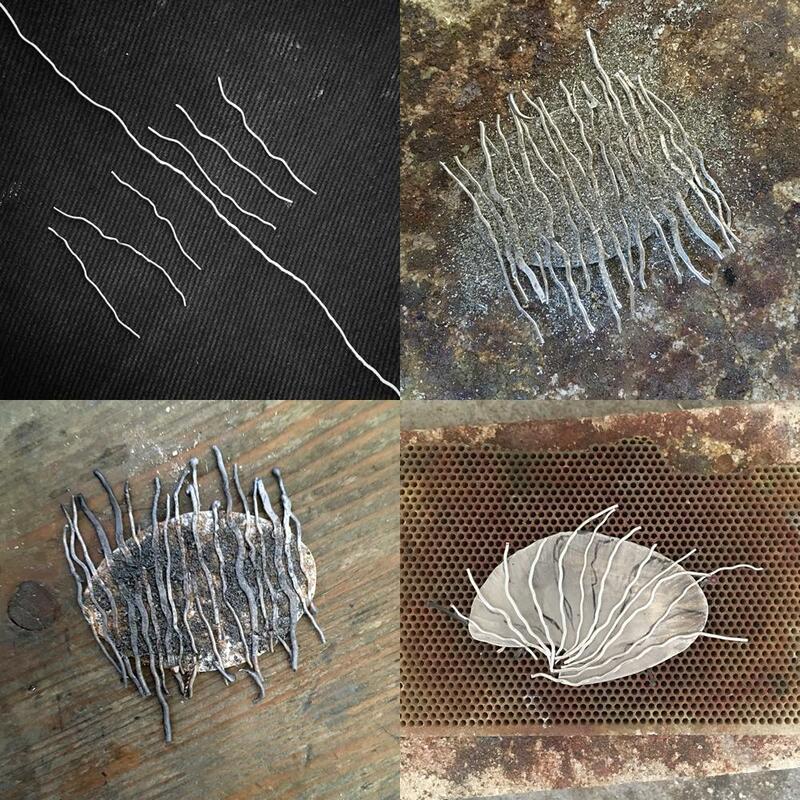 I tried rolling wire and silver sheet through my rolling mill to get a wavy texture but this soon vanished as I started raising the piece to form a dome. I also played around with fusing and reticulation, as I do with a lot of my Echoes pieces, to get a rough/sandy texture. 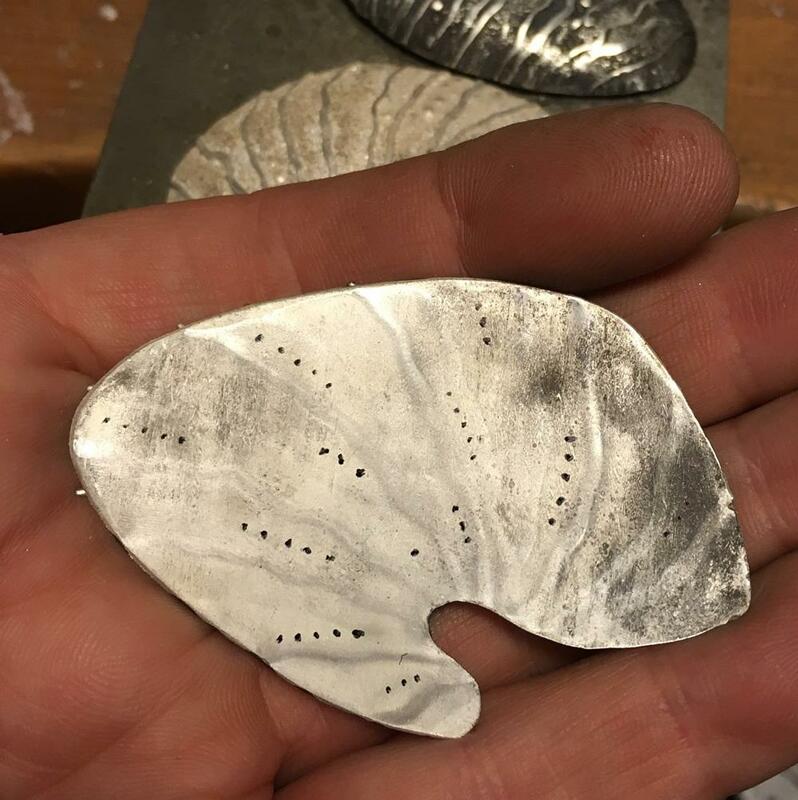 This combined with soldered pieces of wire created a lovely juxtaposition of rough and smooth and the wavy pattern and form of a domed piece started to come together. This is an image of my final test piece. There’s lots I love about it and there’s also a lot that I don’t, but by creating a test piece like this from start to finish enables me to find out what works and what doesn’t so that when I come to make the final piece I know exactly what I need to do. At the same time I get a prototype that’s also beautiful in it’s own right and funnily this test brooch has already had alot of interest. 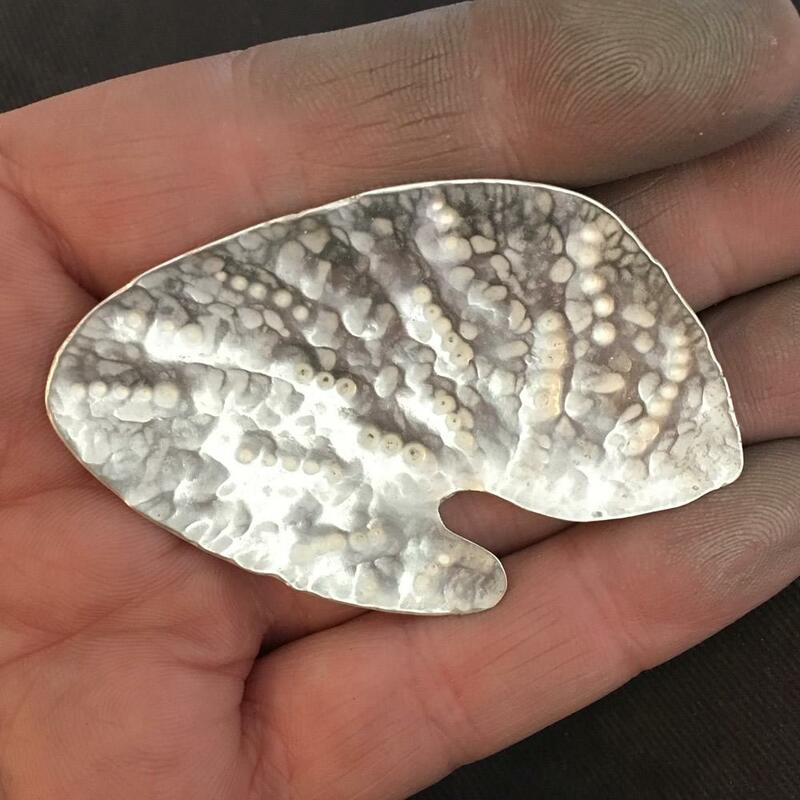 So much so that I sent it off to the assay office to get hallmarked alongside the final brooch in case I decide to list it in my online shop after the holidays. 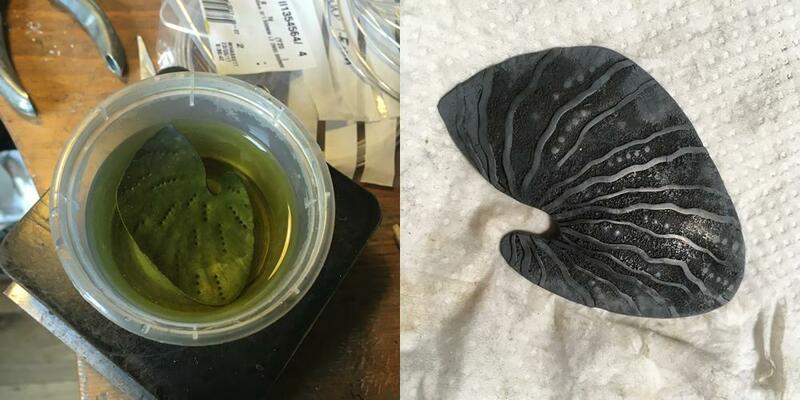 I made a second test piece to try out the shape of a Devil’s Toenail Fossil but by this point I was ‘in the zone’ and didn’t take any photos. It’s smaller than the final piece and lighter and may also be turned into a finished brooch and listed in my online shop. With all this experimentation under my belt I started working on the final piece. I wanted it to have the same weight as the first test piece, so I started with the same size of spoon bowl. Even though I wanted to finish with a domed piece, it was important to flatten the bowl in order to build up the layers of textures and pattern – this would’ve been too tricky on a domed piece – I tried and failed at the experimental stage. I didn’t photograph every stage of the process unfortunately – sometimes I just get engrossed in what I’m doing and forget to document. But here are a few photos showing the back of the piece before and after hammering to raise it into a dome. And here is the front at this stage too. 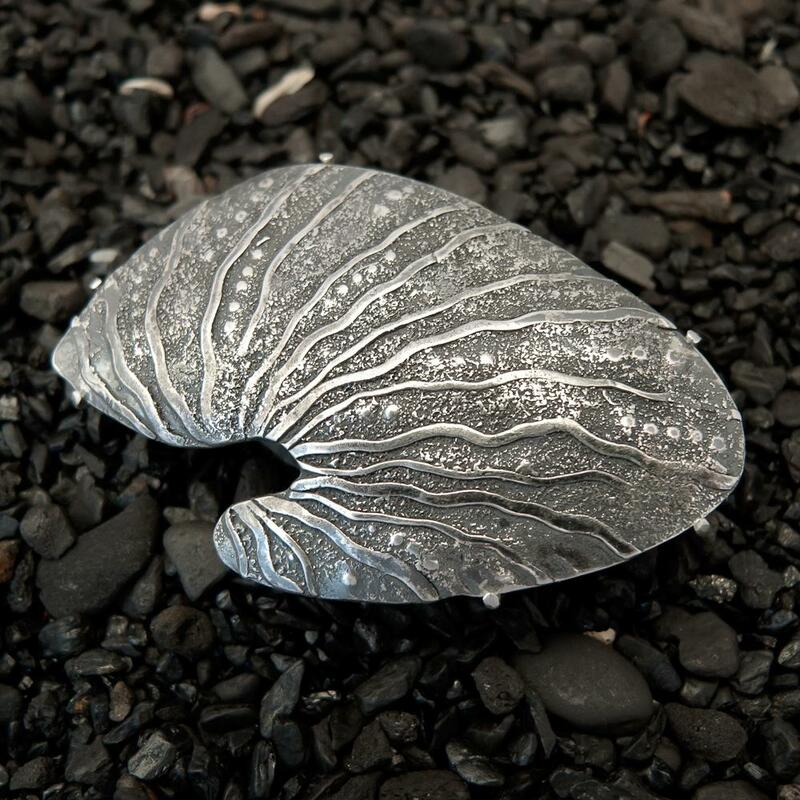 The silver was then oxidised – a process that turns it all black – and polished back to reveal the gorgeous textures and patterns. 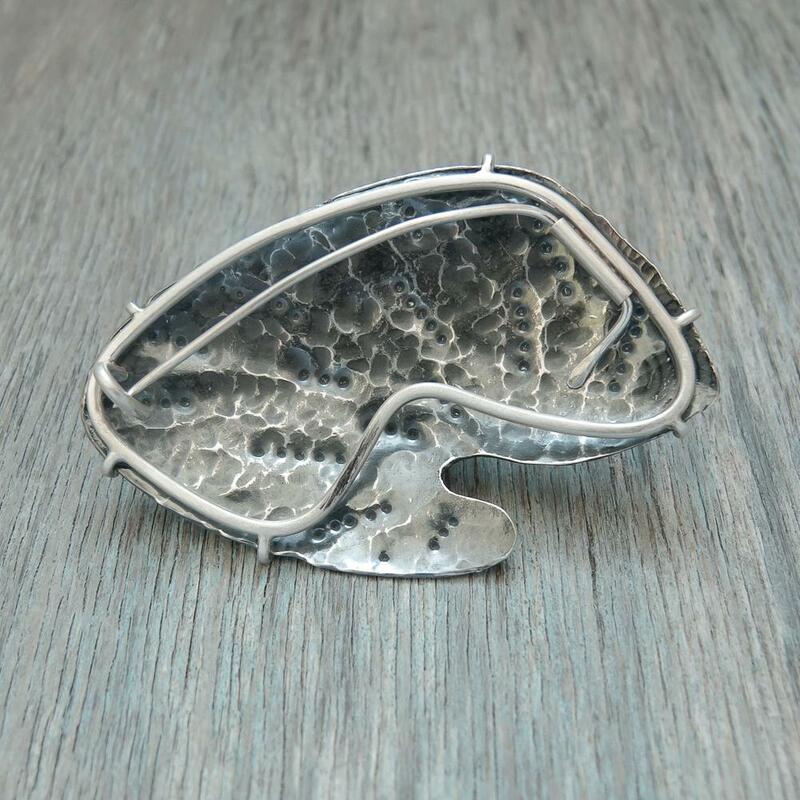 I then handcrafted a bespoke brooch back that followed the curves of the piece. This was quite a soldering challenge, but worked out really well. And by now I bet you’re dying to see the final piece! What a beautiful thing it turned out to be. I wasn’t that fond of the shape at the start of the project, but by the time I’d finished it, I’d fallen in love with it. But off to the assay office it had to go, so I only managed to take a few simple photos of it. The assay office called me today to let me know it’s heading back my way, so I can’t wait to see it again, take some better photos and then send it onto Emma to pass on to Beca who will then award it as a prize to the winner of this years treasure hunt. If you want to be in with a chance of winning it, you need to take part in the treasure hunt and you can find out all the details about The Hunt for the Devil’s Toenail over on the Facebook Event page.